Connective tissues are a critical part of human and animal anatomy. They play many different types of roles, including helping oxygen and nutrients travel throughout the body, connecting bones to each other and protecting muscles from injury when people stretch, bend and jump. One of the types, fibrous connective tissue, is especially strong. It helps to bind your different body parts together, keeping your body connected, agile, and protected. Three types of fibrous connective tissues include ligaments, tendons and the sclera, which is the white outer layer of the human eye. There are several types of connective tissue. One type is fibrous connective tissue, also known as dense connective tissue. The fibrous definition and distinction comes because dense connective tissue is made up of fibers. Those fibers are mostly made up of collagen as well as some fibroblasts. It is different from loose connective tissue, which is made up of more elastic fibers in addition to the collagen and fibroblasts. As its name implies, its structure is more stretchy and loose than dense connective tissue. To define fibrous connective tissue, you normally separate it into two categories: regular and irregular. In regular dense connective tissue, the fibers are arranged in parallel bundles, and are often white or yellow colored. One type of regular dense connective tissue is a tendon. It is important that the fibers inside tendons are dense, as tendons connect muscle to bone and must be strong in order to keep the two working bound together. Tendons work especially hard during periods of activities like jumping, pivoting and contact, as any of those sudden movements or blows could tear the tendon and lead to bone or muscle failure. 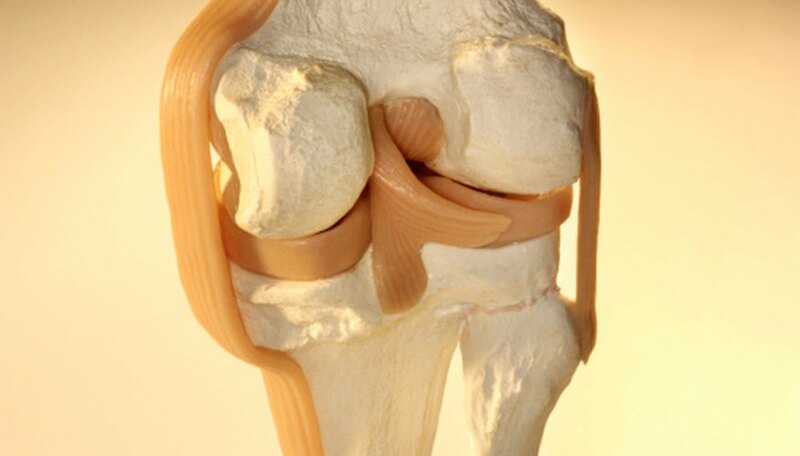 Ligaments are a second type of regular dense connective tissue. Their connective tissue function is similar to tendons, although instead of connecting muscles to bones, they connect bones to bones. Their dense, parallel structures help guarantee that bones don’t move enough to break. The breakdown of a ligament could result in bone rubbing against bone, which can be incredibly painful. The second type of fibrous connective tissue is irregular. Its fibers are not arranged in parallel bundles. Instead, they are arranged in a thick and protective interweaving layer of mostly collagen fibers. One example of an irregular dense connective tissue is the sclera, or the white outer layer of your eye. While it may seem delicate, the sclera is actually quite strong. Its protective layer of dense fibers works as a line of defense to protect outside forces from entering your extremely sensitive eyeball. Healthline: What's the Differences Between Ligaments and Tendons? Dragani, Rachelle. "Three Types of Fibrous Connective Tissue." Sciencing, https://sciencing.com/three-types-fibrous-connective-tissue-8447250.html. 15 August 2018.